One of the best ways to know a neighborhood is to leisurely walk around it. 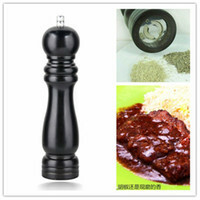 But to know which restaurants to visit can be time-consuming and expensive. Luckily for curious minds and stomachs like mine, there are “Tastes of (insert neighborhood of choice here)” popping up all around the city. Taste of Little Italy and Taste of Gaslamp were held in early June and two weekends ago was Taste of Adams Avenue. Adams Avenue spans across several neighborhoods from University Heights to Kensington. It’s a long journey on foot, especially daunting that weekend with temperatures in the mid-80s. Only the brave and the very fit attempted to walk the entire route. For those less inclined to sweat or get sunburned, trolleys were available to usher patrons from one end of Adams Avenue to the other. 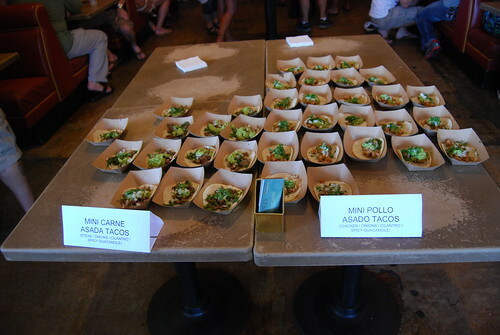 As for the food, 30 restaurants participated — everything from Thai and burgers to even Starbucks. Some notable places included TAO, Viva Pops!, Farmhouse Cafe, Cueva Bar, Burger Lounge, Twigg’s Bakery and Coffee House and Blind Lady Alehouse. It’s a self-guided tour but one punch = one visit. No revisits. The pure fun in the “Taste Of” festivals is the opportunity to try new restaurants. On the flip side is the danger of possibly overeating. If you plan to try a little bit of everything— just one bite or the whole sample— it all adds up in the end. Sample sizes also varied from place to place. One of my favorite discoveries was Mariposa Ice Cream. These folks offered a choice of two flavors and full scoops, no less. 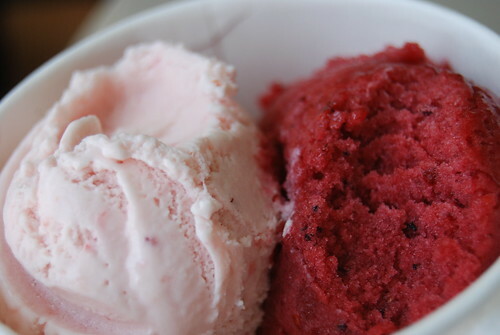 On a hot day, the berry sorbet and strawberry was a welcome refreshment. They didn’t bother punching the card (should’ve gone back for seconds!). 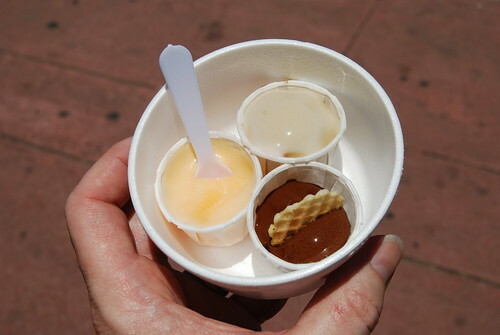 On the other end of the ice cream spectrum were the sad samples from Romi’s Soft Serve Heaven. The samples were pre-melted even before we stepped outside into the baking heat. I actually get more of a sample at Yogurtland. The flavors weren’t noteworthy, either. To my knowledge, only two places served TJ-style tacos: Rosie O’Grady’s Irish Pub (with lines outside the door) and Ponce’s Mexican Restaurant (seen above) with a choice of chicken or beef tacos. 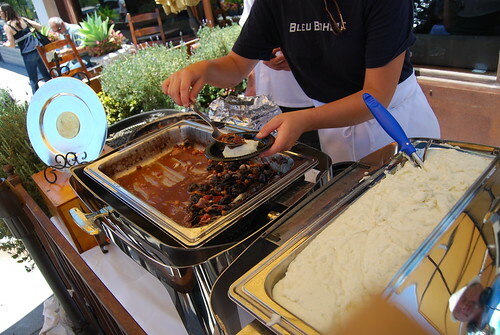 The dish that made me leave my comfort zone were the sauteed escargots with linguiça sausage on top of blue cheese mashed potatoes from Bleu Bohome. It’s something I wouldn’t order on my own but finally had a chance to try. 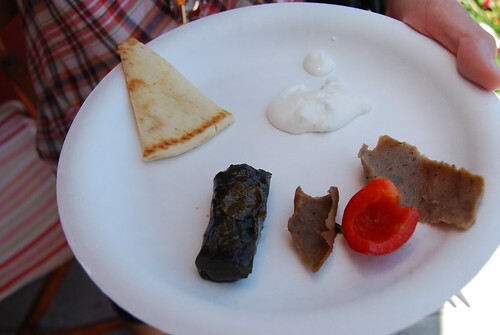 If there was an award for saddest plate, it would go to Country Kabob Greek Restaurant. A smaller plate would do wonders for this minimalist offering. Viva Pops! was another nice treat for the hot day. Their samples were snack-size pops, either dairy- or fruit-based. Having had Viva Pops! before, I immediately went for salted caramel and it did not disappoint. Unfortunately, toward the end of the tasting (I had already been eating for 2 hours) I was too full to enjoy the sticky ribs and cornbread from Kensington Cafe and the slider from Burger Lounge. The cost for an afternoon was $25 in advance and $30 at the door. It’s a cost-efficient way to try restaurants— as many as your stomach will allow— in the span of an afternoon. More photos from the event can be seen here. 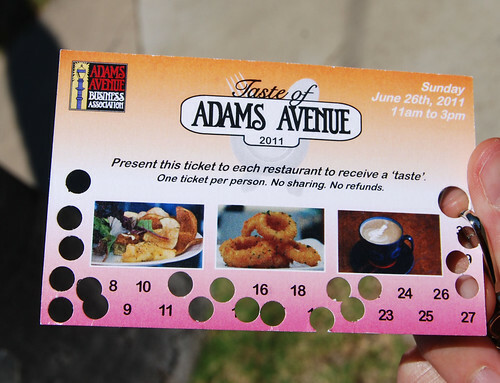 *Tickets to the Taste of Adams Avenue was graciously offered by McFarlane Promotions. Everything looks so good minus the escargot. How were the snails? I think it’s purely a mind over matter thing regarding snails. The snails were delicious especially when in the context of the red wine sauce and blue cheese mashed potatoes. On their own, I would have problem eating them. hi darlene – i have always wondered about that romi’s soft serve place. glad you liked mariposa – they really are generous with their scoops. 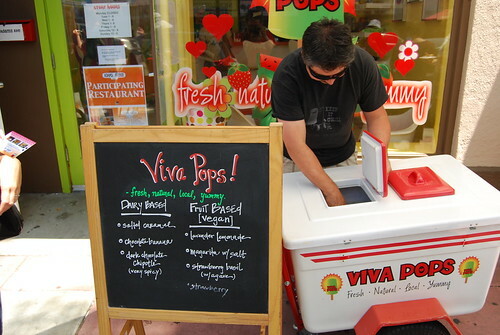 next time i go to viva pops, i will have to try their salted caramel. i didn’t know they had that flavor! this event sounded fantastic – hopefully i can go next year. I’m glad I discovered Mariposa. What a great shop! I know you blogged about it a few times. The food from Tao was great and generous too. There’s always room for ice cream! Mariposa is the best! Love it, love it, love it. That plate does look sad as anything. If you’re only serving a bite, at least work on the presentation.